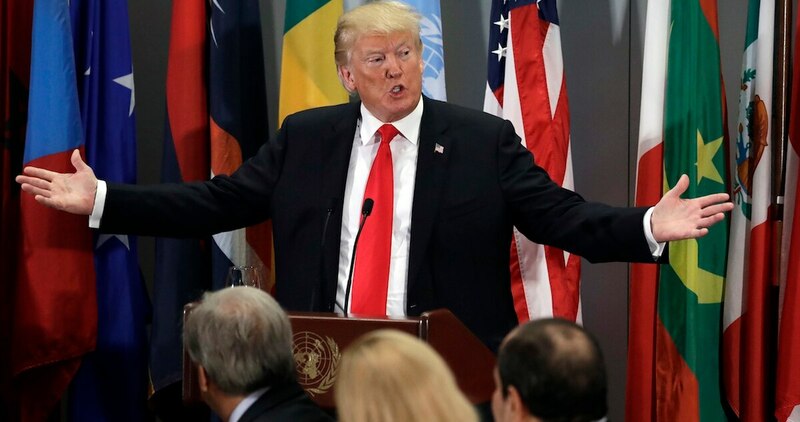 CARACAS, Venezuela — President Donald Trump suggested on Tuesday that Venezuela’s leader Nicolas Maduro could be easily toppled by a military coup and the U.S stepped up financial pressure by slapping the socialist president’s inner circle with fresh sanctions. Trump declined to respond to questions about whether a U.S.-led military intervention in the crisis-stricken country was possible, saying he doesn’t reveal military strategy. "It's a regime that, frankly, could be toppled very quickly by the military if the military decides to do that," Trump said in comments on the sidelines of the U.N. General Assembly. "It's a truly bad place in the world today." Earlier in the day, the Trump administration slapped financial sanctions on four members of Maduro's inner circle, including his wife and the nation's vice president, on allegations of corruption. As a meeting last August in the Oval Office to discuss sanctions on Venezuela was concluding, President Donald Trump turned to his top aides and asked an unsettling question: With a fast unraveling Venezuela threatening regional security, why can’t the U.S. just simply invade the troubled country? "We are continuing to designate loyalists who enable Maduro to solidify his hold on the military and the government while the Venezuelan people suffer," Treasury Secretary Steven T. Mnuchin said in a statement. Over the past two years the Trump administration has sanctioned dozens of individuals, including Maduro himself, on allegations of corruption, drug trafficking and human rights abuses. But until now it had spared key leaders like Delcy Rodriguez, as well as the U.S.-trained Padrino, believing they occupy seats of power and could play a key role in an eventual transition. David Smilde, a Tulane University professor who has spent more than two decades living and working in Venezuela, said Tuesday's actions would seem to suggest the U.S. has given up trying to sow division within the government in the hopes it could force a democratic transition from within. "This clearly breaks from that strategy, said Smilde. "If everyone is sanctioned then it could end up uniting the government." Maduro later appeared on state television, thanking Trump for sanctions that he called a badge of honor for those around him in a battle against what he calls an imperialist power. He also blasted the sanctions targeting his wife. "If you want to attack me, come at me directly. But don't touch Cilia and my family," Maduro said, calling her an anti-imperialist warrior. "Her only crime is being my wife." Flores is an influential figure in her own right, and has served in congress as well as a constitutional assembly that has expansive powers. Beyond rallying Maduro's opponents, it's unclear what impact the sanctions will have. For over a year, top U.S. officials have struggled to build support for more-sweeping oil sanctions, facing resistance from energy companies still active in the country and fearing it could tip the OPEC nation over the edge at a time of hyperinflation and widespread food and medicine shortages. The latest sanctions by the U.S. Treasury Department also seized a $20 million private jet belonging to an alleged front man for powerful socialist party boss Diosdado Cabello. Trump publicly floated the idea of a military option in August 2017, but since then he has avoided making any direct references to a possible attack. Maduro, however, has repeatedly accused the U.S. of backing attempts to overthrow him. 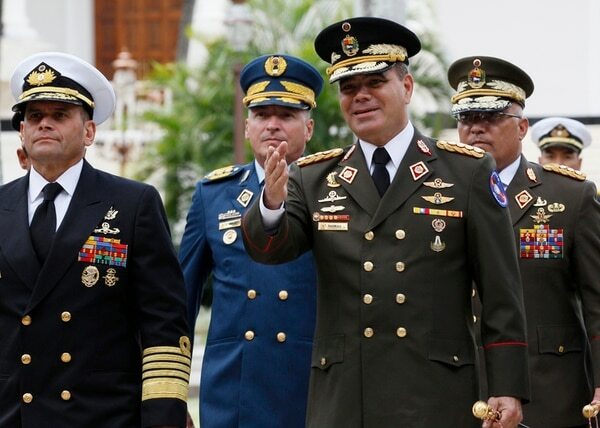 But Fernando Cutz, who until April led U.S. policy on Venezuela at the National Security Council under both Presidents Obama and Trump, said that only in unusual cases would the United States employ military action in Venezuela. An attack on the U.S. Embassy in Caracas harming American citizens would warrant a military response, he said, or a scenario where Venezuelan government forces slaughtered 1,000 or more of its own people. Cutz spoke publicly Monday at the Wilson Center think tank in Washington for the first time since leaving government. He said he did not back force as an option, but that it's likely the only way the entrenched Maduro regime could be removed. "For us to remove that from the table is irresponsible," Cutz said. "We need to keep all the options on the table." Adding to the political pressure, a bi-partisan group of 11 senators on Monday introduced sweeping legislation that calls for expanding humanitarian relief to Venezuelans by $40 million and increasing pressure on Maduro's government. "From the country's plummeting economy to the deterioration of the rule of law, something has got to change," said Senator David Perdue, a Georgia Republican and member of the Armed Services Committee. Vice President Mike Pence pledged an additional $48 million to help Venezuelans fleeing their country's historic crisis, bringing the total U.S. aid since 2017 for Venezuelan refugees to $95 million. In a sign of simmering tensions, Pence also noted reports of Maduro sending troops to Venezuela's border with Colombia, a U.S. ally, calling it an intimidation tactic.